Voices Across Time was created to help teachers harness the power of song as primary source to supplement any secondary American Social Studies, Language Arts, and Music curriculum. The project has three components (use the buttons at the top of this page to find out more about each): a Teacher’s Guide, the Summer Institute for Teachers, and Lesson Plans and other Teaching Resources. You may also contact us to discuss any specialized requirements you may have; our contact information is located on the About Us page. Also found at this site is an index of Timely Tunes; songs appropriate to enhance discussion of any major holiday or historical anniversary. Songs have a special power to express what words alone cannot: hopes, fears, dreams, love, hate, anger, pride, aspirations, and disappointments. Because songs span the breadth of human experience, they are uniquely able to communicate across time and space the beliefs and ideas held by their composers, performers and listeners. Yet textbooks are silent. Visual primary resources, like paintings and photographs, are increasingly used as primary resources for teaching history, not just as illustrations. But music seems to be more challenging for teachers: “I can’t carry a tune in a bucket!” or “I can’t read music!” or “Even if I had enough planning time, where do I begin to even look for songs popular during the War of 1812?” Songs don’t stand still for discussion like visual sources do — they exist in time, as well as space. How can you do more than just play music in the background? Music is omnipresent in modern life, especially in the most technologically advanced societies; it is readily available everywhere we go and part of nearly all that we do. Our tastes in music help to shape our personalities and determine our social grouping and compatibility, especially among school-aged children in America. Music is an accessible medium and considered highly desirable to children. It has always been so, no less in the colonial era than in the cyber age. 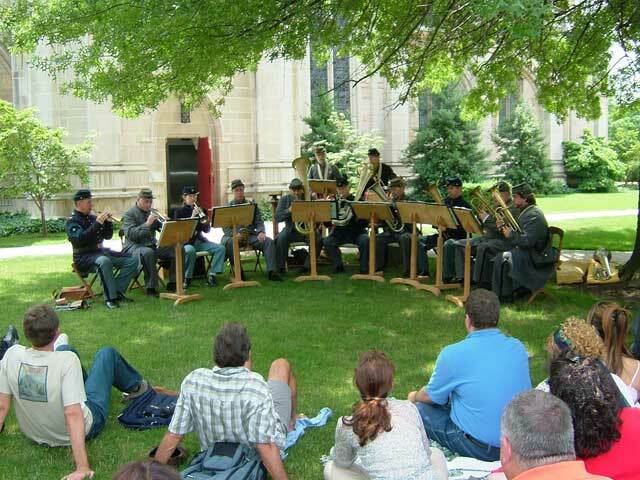 Music is also a potent bearer of cultural ideas, attitudes, and movements. Like works of literature and art that carry indelible messages from the time and place of their creation, musical compositions—and particularly those with texts—are source documents loaded with historical meaning. In addition to its appeal and its cultural messages, music is one of the eight “learning styles” or modes of intelligence identified by educators (and codified by Howard Gardner of Harvard University and others) Studies have shown that music can also help engage students otherwise disaffected by standard classroom techniques, and it helps improve students’ overall learning and performance on tests. Within the past two decades, social studies textbooks have augmented their narrative with samples from literature (poems and short stories) and visual arts (paintings and photographs). Some publishers have begun to provide sound recordings that complement their textbooks. Yet none of the standard texts for teaching American social studies, language arts, or even music systematically includes music as a classroom tool for attracting, engaging, and teaching students about the life, language, ideas, and history of their nation. The core of the program is the extensive Teacher's Guide, organized for ease of coordination with national education standards. 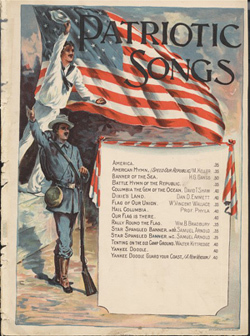 The original Guide included 153 songs spanning 300 years of American history along with teaching techniques and audio CDs to assist teachers in integrating songs into their exiting curriculum. We are currently expanding the original guide to include a tenth unit, bringing the history up to present day, and to increase the representation of ALANA (African, Latin, Asian, and Native American voices) throughout the contents. We are also evaluating a digital delivery method to replace the original paper book. Created by a team of teachers and scholars, it uses music as a tool to teach history and social studies, and is aimed at middle- and high-school aged students. Secondary-school teachers advised on the design of the materials to help them teach more effectively (not to add more curricular material to what seems an already overburdened agenda); the project staff drew on the work of musicologists and performers who have documented and made available a vast array of pieces, forms, and styles of music, along with their societal functions and values, across the entire span of written history of life in North America, and representing nearly all ethnic groups and economic levels of society. Voices Across Time was also the basis of a Summer Institute for Teachers funded by the National Endowment for the Humanities and hosted by the University of Pittsburgh. Offered in 2004, 2006, 2008, 2011, 2013, and 2015. Our summer institutes are currently on hiatus while we retool the curriculum guide, although we hope to offer them again in the future. Lesson plans and song activities prepared by teachers who have attended our Summer Institutes will eventually be made available on this site. While the lesson plans are intensive and require multiple resources and days, the song activities are short and require little effort to engage your students in a discussion about specific historic events. Our Resources page includes links to web sites and bibliographies that relate to American music. Also included is detailed information about Song of America, a three CD, fifty song set of historic American music as performed by contemporary artists. Our About Us page includes information on who to contact to purchase Voices Across Time, to receive upcoming Institute information, or to schedule a workshop at your school. On this page there is also a link to join our list-serv of educators interested in using American music in their classrooms and a record of some of the media attention Voices Across Time is currently receiving.